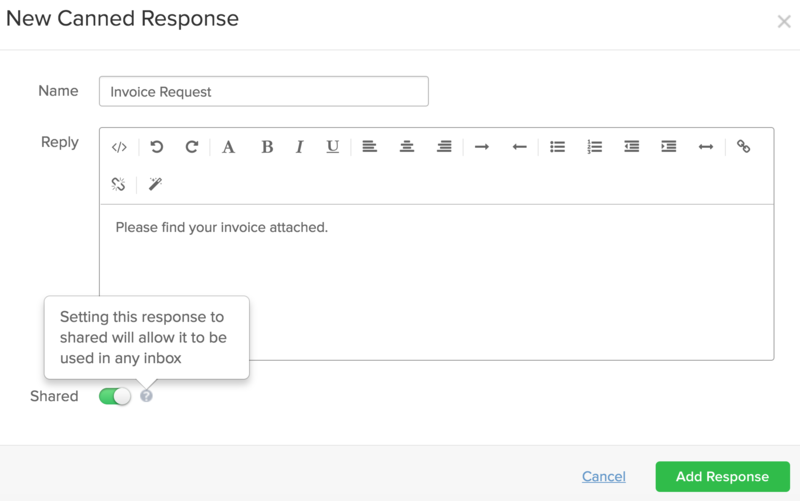 Within Teamwork Desk you can create a canned response to quickly reply to tickets. Canned responses are useful for quickly entering information that you may use frequently. To add a canned response click on the your profile icon to the top right of the navigation bar and select Settings. Near the top of the page select the Inboxes tab. Select the inbox you wish to create a canned response on and then select Canned Responses on the left pane. You will now have the option to create a new canned response to the top right of the screen. A list of current canned responses will also be present. You can filter existing canned responses to more easily find existing ones. When you have created a new canned response you can then insert it into a ticket by clicking the folder icon and selecting it from the list of ones created or search for one in the filter option. You can also (permission dependent) save your current reply in a ticket as a canned response by selecting the Save as canned response option. Note: If you have created a canned response for an inbox it will not show as an option in your other inboxes unless you choose the share option when creating the canned response. By default, only administrators in your Desk account can save and manage canned responses. To allow agents manage canned responses, you will need to update your company permissions. In the Edit Company section of the company settings, select the Agents are allowed to manage canned responses permission.